Fun Wi-fi companions that move and play sounds depending on what's happening in your digital life. 100% DIY-friendly. 233 backers pledged $27,143 to help bring this project to life. As featured in Wired, GigaOM, The Next Web, The Verge, Yahoo!, Today. 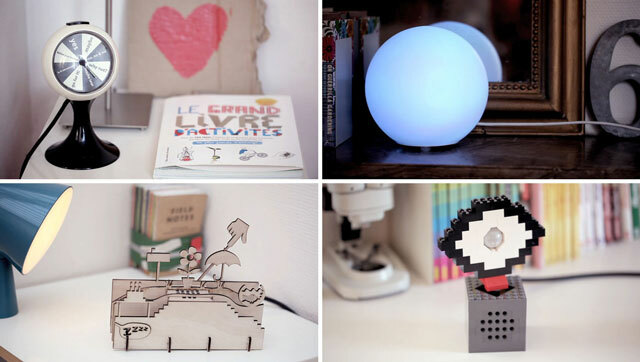 reaDIYmates are fun wi-fi objects that you can build easily. They move and play sounds depending on what's happening in your digital life. Choose from a variety of existing designs, use our templates or create your own object. Then decide what you want them to do through a simple web interface. Link them to your digital life (Gmail, Facebook, Twitter, Foursquare, RSS feeds, SoundCloud, If This Then That, and more to come) or control them remotely in real time from your iPhone. You don't need any creative or technical skills to build and use your reaDIYmate, but if you want to go further, we made it super easy for you to change designs, write applications, or add inputs and outputs. They're Arduino compatible and you can plug 50+ solderless electronic bricks. 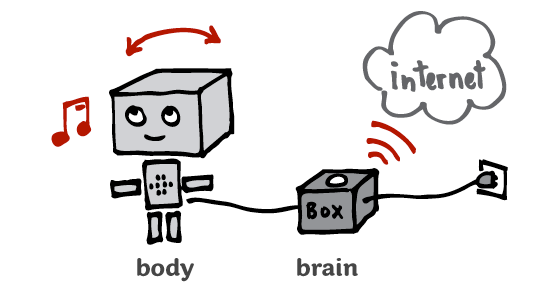 The animated body contains a mini servo motor and a speaker. It is made out of strong, high-quality paper. The computer brain with an MP3 decoder, 2GB SD storage and a Wi-fi chip - safely enclosed in a plastic box featuring a cool arcade push-button. Place them anywhere in your home or office. They don't need to be connected to a computer, just to a power plug. There are a lot of different ways to have fun with reaDIYmate. 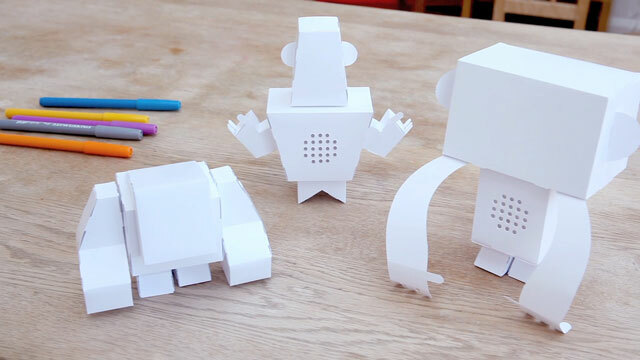 Choose from a variety of existing designs among Paper Toys and Kinetic Sculptures, draw on blank templates or build you own using any other material. Hack existing objects or build your own using the technique of your choice: paper, Lego, wood, laser cutting, 3D printing, modeling clay… anything works. Because the delicate electronics are all inside the reaDIYmate box, you can concentrate on your idea without having to solve complex mechanical issues. You can use our "motor + sound" building block or fit directly the speaker and servo motor into your creation. 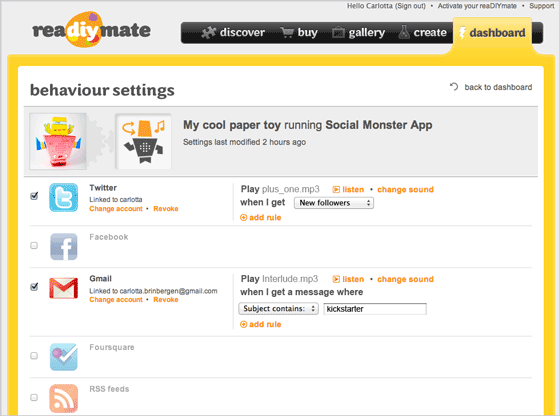 Set up your reaDIYmate's behavior by using a simple could-based web interface. Facebook: Move and play an MP3 when you receive notifications, new messages, friend requests and likes (See the video below). Post a status when you press the button. Twitter: Move and play an MP3 when you are mentioned and have new followers. Send a tweet when you press the button. Foursquare: Move and play an MP3 when a friend is in a certain venue. Check-in when you press the button. Gmail: Move and play an MP3 when you receive an email from a specific person or an email where the subject contains a keyword. Send an email when you press the button. RSS: Move and play an MP3 when a feed is updated or when it contains a specific keyword. IfThisThenThat: For even more channels, use ifttt to trigger events on your reaDIYmate. Soundbox: Follow a SoundCloud user and the new sounds will be played on your reaDIYmate when they are posted. Inbox: Send an email with a sound attached to any reaDIYmate and it will play that sound. Copycat: Do exactly the same things at the same time as another reaDIYmate. For each action, choose a sound in our online library, or upload your own MP3s. There’s no need to connect your reaDIYmate to your computer to change its behavior: the reaDIYmate will synchronize automatically over-the-air. If you feel even more creative or want to have some technical fun, we have paved the way for you. reaDIYmate is 100% Arduino compatible. Write your own sketch using our libraries and publish it in our applications directory. If you choose to make it public, any other reaDIYmate user will be able to install it in one-click from the web interface. You can also interact with a reaDIYmate through its HTTP API or web-socket for real-time communication. reaDIYmate is compatible with the 50+ solderless electronic bricks from Seeed Studio (check them here). You can also plug most Arduino shields onto the reaDIYmate board. For more than a year, we have been working on making reaDIYmate a fun and useful companion that spans the digital and physical world. But this is just the start. Your backing will allow us to make the necessary investments for tooling, sourcing, and manufacturing of the first collection of reaDIYmates – and to add new and exciting functionalities. You will get a nice handwritten THANK YOU reaDIYmate postcard and be listed as a founding citizen! 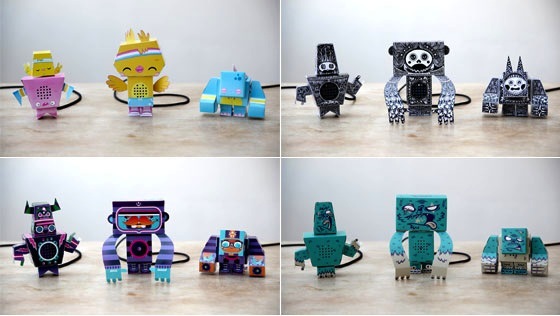 You will get the Paper Toy of your choice (without electronics). We will contact you later to let you choose. Free shipping in the US (add $5 for other countries). You are preordering a Barebone Edition. If you want to start from scratch, this edition is for you. It includes one reaDIYmate box, one speaker and one motor, but NO Paper Toy or Kinetic Sculpture. Free shipping in the US (add $20 for other countries). You are preordering a Paper Toy Edition. It includes one reaDIYmate box and one Paper Toy. We will contact you later to let you choose. Free shipping in the US (add $25 for other countries). You are preordering a Kinetic Sculpture Edition. It includes one reaDIYmate box and one Kinetic Sculpture. We will contact you later to let you choose. Free shipping in the US (add $25 for other countries). You are preordering a Double Edition. It includes two reaDIYmate boxes and two bodies of your choice among the Paper Toys and the Kinetic Sculptures. We will contact you later to let you choose. Free shipping in the US (add $35 for other countries). You are preordering the Limited Edition. It includes one reaDIYmate box and one limited edition Paper Toy, numbered and signed, exclusively created for this Kickstarter campaign. Don't ask what it will be, it's a surprise! Free worldwide shipping. You are preordering your own Custom-Made Edition. We will ask one of our creators to design a reaDIYmate especially for you. You will get five of this unique reaDIYmate. Free worldwide shipping.